Kull stood in the door; Kull, half naked, crouched like a great human tiger, his teeth bared in the moonlight in a snarl of battle fury, his terrible eyes blazing -- the long blade whirling like a wheel of silver in the moon. The 117th anniversary of Clark Ashton Smith’s birth last week was marked by The Cimmerian (here, here, and here), Grognardia, Black Gate, and others with accolades and remembrances. As well it should. 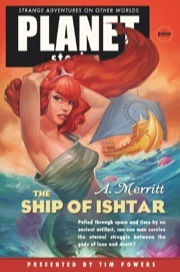 Smith, along with Robert E. Howard and H.P. Lovecraft, formed the weird fiction triptych of the 1920s and ’30s — and in my opinion, he was the most talented member of a talented group. Yet a recurring question in many of these memorials is why Smith remains uncelebrated in comparison to his partners. This is especially vexing when you consider he outlived the other two by almost a quarter-century. Blogger Jackson Kuhl (a personage not unknown to long-time TC readers) wrote the above in an entry he posted on Robert E. Howard’s birthday, ironically enough. 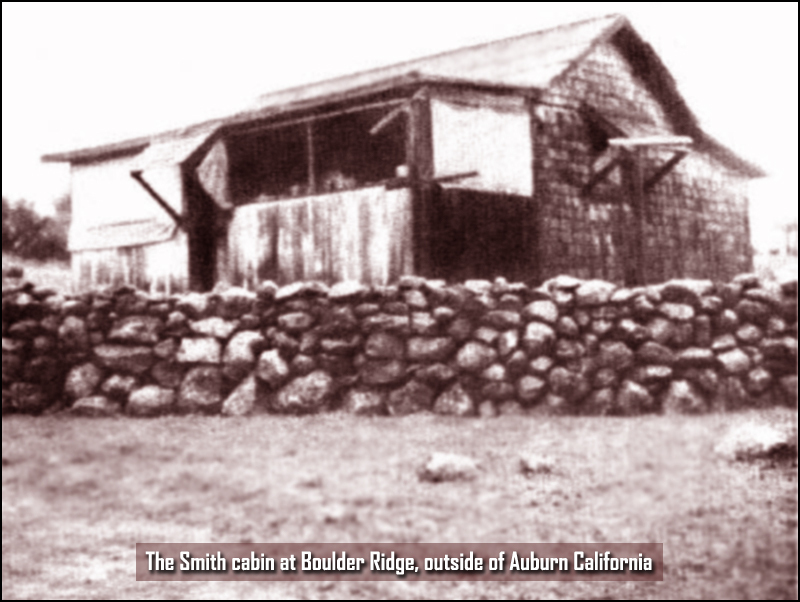 Kuhl’s article, entitled “The Obscurity of Clark Ashton Smith,” answers the “vexing question” of CAS’ lack of literary prominence by pointing the finger directly at those who control Smith’s estate. Kuhl relates his (ultimately futile) struggles to publish an omnibus gathering together all of the Averoigne stories (a collection yours truly has been waiting for these past two decades). It is a disheartening tale, but one that should be read by every fan of the Bard of Auburn. The Cimmerian was not the only venue celebrating the nativity of Clark Ashton Smith this thirteenth of January just past. Cool websites such as Grognardia and Cinerati marked the occasion as well. 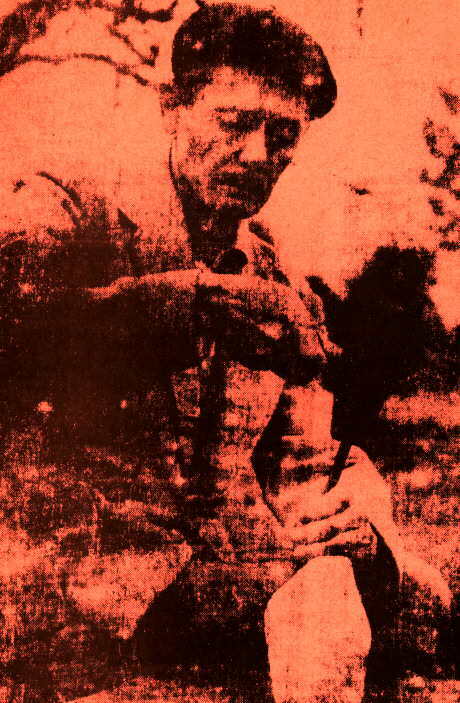 Their tributes differed somewhat from those proffered here in that they noted the influence of Clark Ashton Smith upon the history of fantasy role-playing games. 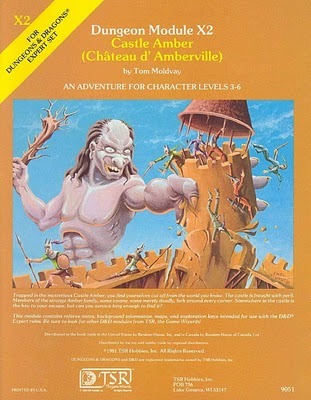 Specifically, they both cited Tom Moldvay’s Castle Amber gaming module as being what led them to Klarkash-Ton. What is particularly striking about both tributes is that Castle Amber remains the one, single, solitary example of an RPG product that either blogger concerned (or myself) knows about which was largely based upon the works of CAS. Yet, that module appears to have exerted an outsized influence over the years. Clark Ashton Smith gets credit for a lot of things, at least by those who are aware of his work. He was arguably the first poet to versify from a truly cosmic viewpoint when he wrote his legendary “The Hashish-Eater.” His poetry and prose, as well as his inimitable drawings, paintings and sculptures, captured the attention and respect of H.P. Lovecraft, who name-checked CAS in his own tales more than any writer, even Dunsany. Smith was a highly valued correspondent of Robert E. Howard. 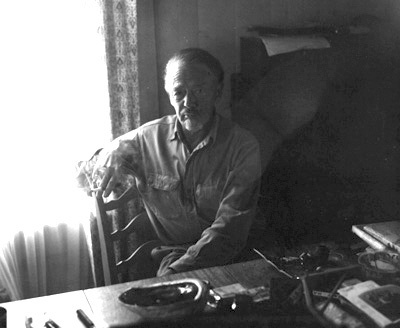 Clark Ashton Smith was admired by (and sometimes mentored) younger authors such as Bradbury, C.L. Moore and Leiber. 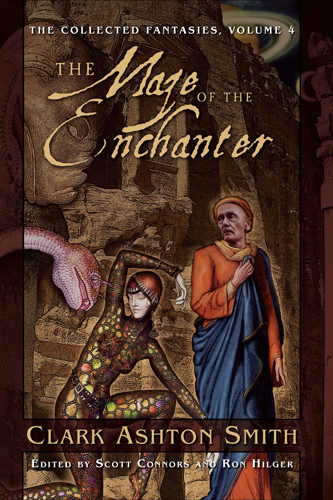 His tales of Zothique were patent inspirations for later works by Jack Vance and Gene Wolfe. One thing that Clark Ashton Smith decidedly does not receive much credit for is being one of the founding fathers of the heroic fantasy genre. On this, his one hundred and seventeenth birthday, I’d like to give him his due. Last weekend, Nick Owchar reviewed The Return of the Sorcerer for The LA Times. 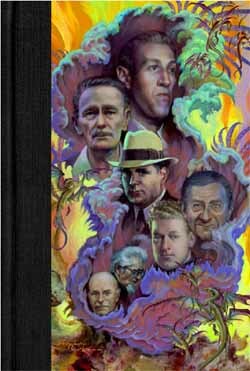 The book itself is a new “best of” collection featuring the tales of Clark Ashton Smith and is published by Prime Books. Mr. Owchar proceeds to quote a bit from what sounds like a solid introduction by CAS (and REH and HPL) fan, Gene Wolfe. Owchar calls Smith “an overlooked master of a wholly original vein of horror and hallucinatory science fiction,” while also noting CAS’s endeavors in the fields of poetry as well as the graphic and sculptural arts. Towards the end of his review, he expresses a deep admiration for Smith’s work and a hope that Klarkash-Ton’s oeuvre will soon achieve the recognition it so richly deserves. 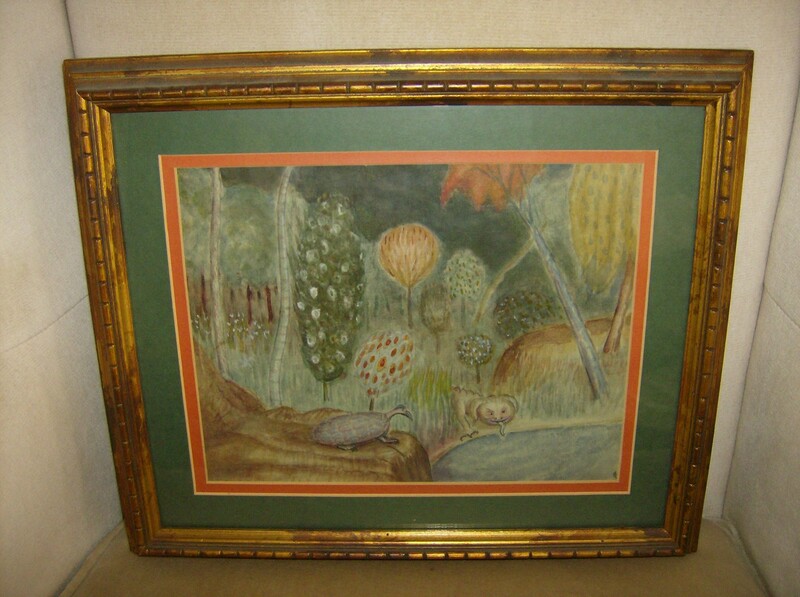 Image area approx 8.75″ x 11″ double matted and framed under glass to approx 14″ x 16.5″ Medium appears to be pencil, crayon & watercolor. While not as rare as Smith’s carvings his color originals, especially larger examples as this one are infrequently offered. Provenance: collection of Lin Carter, obtained from his widow ca. 1992. That’s what “pulpster,” the purveyor of the painting above, has to say. The asking price is $2,800, with both “Buy It Now” and “Make Offer” options available. 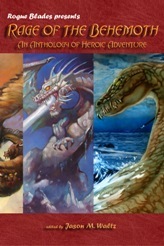 The new sword-and-sorcery anthology from Rogue Blades Entertainment, Rage of the Behemoth, has hit the streets (and my mailbox). In this newest offering from RBE, editor Jason M. Waltz has upped the ante. Overall, this collection of S&S tales exceeds its worthy predecessor in both quality and consistency. Waltz’s theme for this book is that each protagonist must face a “behemoth”; in other words, a “large monster” of some sort. Despite my initial scepticism, the idea works well. Right off the bat, Rage of the Behemoth just looks better than its older sibling. 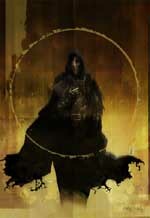 Johnney Perkins turned in an eye-catching painting for the cover of The Return of the Sword. His work on the multiple covers for Rage of the Behemoth is another big step forward for him. Waltz has also enlisted the talents of the Frenchman, Didier Normand, for the multiple covers featured in this edition. Normand’s art is obviously influenced by Frank Frazetta (which Normand admits). However, Normand not only captures, to an extent, the look of the Michelangelo of Brooklyn, he also does a good job of capturing the feel and energy of Frazetta (in my humble opinion). At his best, Normand reminds me of the late-’70s Ken Kelly. I’ll be keeping an eye on this guy. Interior artist, John Whitman, turns in some solid line-work for the book, but I found myself wishing that the inking was a bit better. Cimmerian alumnus, [redacted], provides the introduction for this volume. His lead-off sentence, a true keeper, is, “Mock Sword and Sorcery at your own peril.” The rest of the intro maintains that standard and tone. John O’Neill, publisher and editor of Black Gate magazine, turns in a good foreword.